The artworks reflect local lifestyle changes. We are living in a diverse cultural environment where new galleries, exhibitions, art crawl, indoor and outdoor music festival, indoor and outdoor fine dining establishments are changing and enhancing the lives of Canadians. I have been inspired by these changes and they are the focus of my artwork. Maria H. Sarkany, SCA was born and educated in Europe and graduated from the School of Fine Arts in the Faculty of Textile. She is a winner of the 1999 Royal Canadian Mint contest. 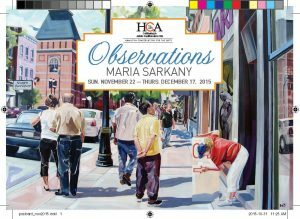 Maria has had numerous solo, juried and group exhibitions. Her award-winning paintings and graphics are displayed in corporate and private collections in three continents.